Mariposa Bloom (2017). Oil on canvas. Super Bloom (2017). Oil on canvas. Borrego's Bounty (2017). Oil on canvas. 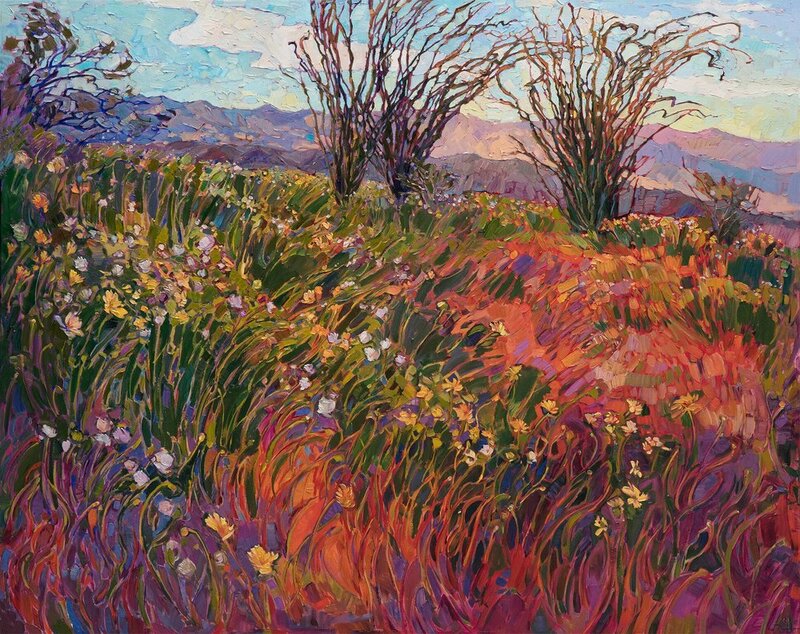 Erin Hanson was eight years old when she began painting, she ‘started commissioning paintings at age ten, and by age twelve she was employed after school at a mural studio.’  Since then, Hanson has won numerous awards and opened her own gallery, The Erin Hanson Gallery. PC: Can you tell us a bit about your background and how you got started in the art world? EH: I think all of us begin as artists, and like many small children I sketched what I saw around me and painted with various mediums from watercolors and inks to oils. I was lucky enough to go to a small private school that had a rich arts program and an art teacher that fostered my love of painting through most of my formative years. I worked in a mural studio when I was teenager, where I became the official color-mixer, mixing gallons of acrylic paint to match colors the lead artist made up in little dixie cups. I decided to fully pursue the arts as a career when I was well out of college (with a degree in bioengineering) and had started my own business that was rolling along well and offered me time to rock climb and explore the natural landscapes of Nevada and Utah. I have always loved impressionism but my greatest source of inspiration has always been natural landscapes. It was kind of a brilliant moment when I managed to connect these two passions and ended up deciding to paint one piece a week. I love a good challenge and was raised with the importance of practicing and applying yourself daily to become good at something. I have now been painting at least one painting a week, every week, for the past decade. I always experiment and push myself as an artist, striving to capture the dramatic landscapes and fleeting light and color I love so much. PC: Art and science are often seen as dichotomous. Do you think they are? And does your science background influence your art in any way? EH: I am sure they are different in many ways but both certainly take dedication, attention to the fine detail and a willingness to always be learning. In that way, I believe there are many parallels and that my education in the sciences has enhanced my abilities and approach to the arts. PC: When and how did you decide to become a professional artist? EH: I was raised to do everything as a professional. If you are going to do something then you might as well be the best and really apply yourself. Even as a child I was selling commissions of friend's dogs, and I even did an album cover on commission (and got paid in a giant stack of $2 bills.) When I finished college, I had been creating a painting a week for a year before I decided to start selling my new impressionist paintings. I started doing outdoor art festivals and gradually built up quite a demand for my work, eventually opening my own gallery about 5 years ago. PC: How did you develop your style and from where/whom did you draw your inspiration? Vincent Van Gogh. 1889. Irises. Oil on canvas. EH: I visited the Getty (in Los Angeles) on a school field trip when I was pretty young. I remember seeing “Irises” by Van Gogh. I think that moment was fairly pivotal for me; I really responded to the color and life he portrayed. Then I recall seeing actual irises while planting in my mother's garden, we were outside working and I was struck by how beautiful they were but how the painting was even more beautiful. I always wanted to be an impressionist painter, although I had to work through the "realistic" phase first, which took many years, and many discarded paintings. PC: Were you deterred from becoming a landscape painter and if so, what, if any, effects did this have on your artistic style and/or career trajectory? EH: Not specifically landscapes but certainly on being an artist. I was told, as most aspiring artists are, that it is too hard to make a living as an artist. In my opinion, it is quite easy to sell paintings and make a living, but you have to be willing to work hard (80 hours a week is very common) and learn how to market yourself. Being able to create amazing paintings is only half the game, then you have to be able to get your paintings in front of people so they can see them! I think the modern or contemporary art world shies away from landscapes or natural beauty. I don’t really understand why since it is one of the most pleasing art forms to the eye and certainly one of the most popular. I have a hard time keeping up with the demand for my work, so I am not so concerned about what the great “curators” or “critics” might say, but what the actual collectors and fans think and feel as a result of my works. PC: Would you encourage people to enter landscape painting professionally? EH: If they are drawn to that subject matter then certainly. I think it is hard to follow a pursuit just because it is “in” or popular. I wouldn’t shy away from it due to trends or whatever. I definitely wouldn’t let your opinions be adulterated by outside sources. PC: When and why did you decide to start your own gallery? EH: Honestly, I kind of had to. I was working out of my Burbank home for years and it got to the point where I was annoying my neighbors with how many canvases were coming in and paintings were being shipped out. One of them reported me to the city and this inspector came and said to me: "There have been reports of too many canvases." Once the inspector determined I was actually making a living as an artist, he gave me two weeks to move my business out of my home. That was a little bit terrifying but I pretty quickly realized the next step was to create a gallery and studio space. It allowed me to expand quite a bit and within a couple of years I had outgrown the first 2,000-square-foot space and moved into a 5,000-square-foot space in an artsy neighborhood near downtown LA. I later upgraded again, and I now have an even larger gallery and studio space in San Diego. It is much prettier down here. PC: Did you purposefully choose to forgo gallery representation and if so, why? EH: This is really a personal preference, I have worked with galleries in the past and likely will in the future. I do work with galleries but typically for exhibitions or limited engagements. I approach this as my “game" as it were, so I prefer to have the reigns when it comes to when and how my works are displayed. It is also an issue of keeping up with the demand, I can hardly keep pace with the requests for my work at this point so I have a hard time sending off my paintings to outside businesses that I have no real idea on what they will do with them or if they will even hang it consistently. PC: Have you ever/Would you ever consider expanding the gallery to represent other artists? EH: My goal is to have a platform to represent my paintings, this has worked very well. It does not align with my business model and goals to bring in other artists. I do recommend that other artists be dedicated and driven in accomplishing their own goals, and I hope to inspire others in seeing that success in this industry is possible. PC: Does the stress of owning and operating your own gallery impact your art life and if so, is it worth it? EH: I never worry too much about “stress”. I probably enjoy the “art” of business as much as I enjoy actually painting. I enjoy working with my staff and making plans. It helps me greatly to have the reins and be able to personally control the presentation of my pieces. We have a great team here at the gallery. We are able to work with other galleries, museums, wineries, country clubs and designers quite seamlessly. PC: Would you recommend emerging artists develop their own business and marketing skills to secure their professional career, as opposed to relying on galleries? EH: Absolutely. Galleries, gallerists and curators are important pieces of the puzzle but the more hands-on you can be the more likely you are to actually get your art in front of collectors and fans. We live in the modern age where you can really be as successful as you want to be, there are so many resources available to artists online for free. You just have to figure out how you want to play your game. 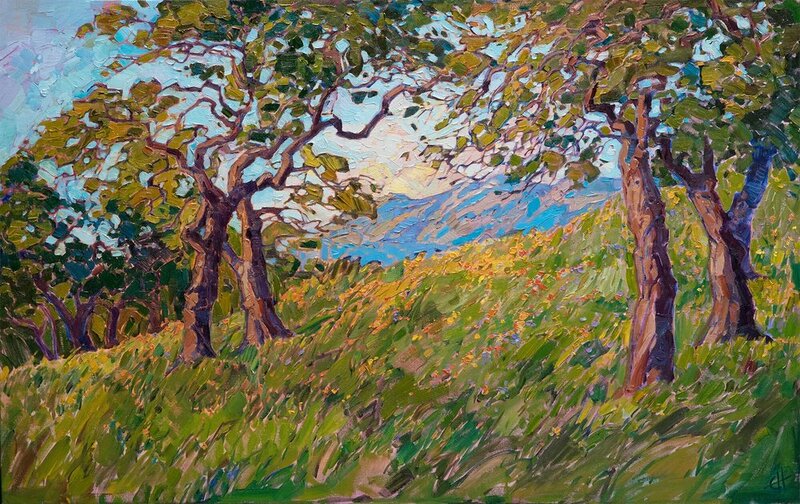 For more information on Erin Hanson's work visit her website here.